I only caught the second half of the documentary about the life of the Buddha that was on tonight. It was narrated by Richard Gere. I found the show to be so moving! My Dad said once that if he could chose a religion, he would be a Buddhist. I thought that was funny because surely you can chose any religion you want, right? But I guess I see his point because when you are Jewish its not just a religion its your cultural identity. I am not sure I am allowed to be a Buddhist, but I know that I am allowed to learn all that I can from all the holy people that have written down great truths. Here is a quote from the PBS website for the show. 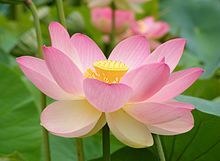 “Imagine a red lotus that had begun life underwater but grew and rose above the surface until it stood free. So I too have transcended the world, and attained the supreme enlightenment." "Remember me as the one who woke up." I would like to be a person who is awake. I wold like to be able to find some measure of peace and joy in life. I strive to let go of perfectionsm and life in the moment. I think these are ideas that Buddha would approve of. I don't like to be treated like door mats, but on the other hand there is a place where I have to just let go. Other people's bad behavior comes from the pain they are experiencing. Once you realize that - it becomes easier to be compassionate and have forgiveness. Jin's Religion and Philosophy class took a field trip to the newly constructed Hindu temple in Lilburn today. While they were not allowed to take any photos inside, he was able to take pictures of the outside of the building, which is the largest Hindu temple in the US. Made of sandstone and marble and containing no metal foundation, the Shri Swaminarayan Mandir is quite striking for suburban Atanta, and really shows the diversity of our city. Here is a great photo he took of the Mandir. Speaking of field trips, Ben is starting kindergarden on August 11th. We are considering one last weekend getaway before school starts. We were thinking of visiting the Sea Turtle Rescue center on Jekyll Island. Or maybe check out Outer Banks rentals. I just came across a really "cool" essay called Jewish Cool: Tales From Appalachia from the Sh'ma website. Its by Erika Meitner, a poet and faculty member at Virginia Tech. I found myself doing alot of head bobbing agreement while reading this. Almost makes me want to go out and get a Jewish tattoo or make a beaded she-pa head covering. Almost. By the way - my cafepress store (see link upper right hand corner of blog) got some good search results from a search for Alien Peace Sign. I still remain hopeful that I can make a buck from these gorgeous high quality t-shirts with original art. Zeb the alien throwing the peace sign --- what could be more cool than that?